Bedford-29 wrote: Here is a better picture of 728 after the scumbag (graffiti) attack.Picture from the Tasmanian Police facebook. Besides that any leads on the turds that damaged 728. Give 131 444 a call. I'm not a police officer. Sorry I asked no wonder I don`t come on here hardly anymore. To keep those interested in the "loop". Roll-out of the second-hand buses at Metro is still slowly occurring. Spotted doing "testing" were #402 & #404, whilst the first artic (#731) is still yet to make an appearance in the "training" capacity. L94s ALREADY transferred to Burnie are #400, #401 & #403, whilst #631, #633 & #244 have returned to Hobart. Northern correspondents report Merseylink (Devonport) have purchased 2 x ex Willunga Charter MAN/King Long and Tasmania's own Redline have a new BLK CityRider (rigid) enroute, destined for Smithton > Burnie route. Tassielink Transit have a new bus on order (has been since April) and Red Decker has a new Ankai on the way also. Cruise Ship season is underway again, although due to works on Hobart's waterfront, access to vehicles is a bit limited at the moment, however the usual contenders have been spotted for the first couple of ships. 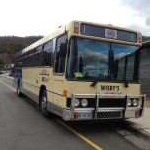 Wynyard Bus Lines' Volvo/Highlander #20 (The Ghan) was one spotted on the first ship. Hopefully that's covered everything happening down here in littl' old Tassie. Thanks Neil.I'd call Tassie fantastic !!!! Introduction of Turn Up and GO between Shoreline and Hobart that provides a high frequency services between 7am and 7pm, running every 10 minutes Monday to Friday and every 20-30 minutes on weekends. Improved services to Brighton and Old Beach. Revitalisation of direct services to the University of Tasmania from the eastern shore and northern suburbs. Well the annual POINT to PINNACLE "Fun" Run has been conducted for another year. Over 3,000 entrants according to reports. Metro were the sole transport provider this year (normally O'Driscoll assist with 6-7 buses) Metro provided 62 buses for this year's event and below is a list of buses used (for those interested). VOVIIs - 115, 147, 148, 150, 151, 152, 153, 166, 168, 169, 174, 176, 178, 179, 181, 182, 184, 185, 189, 190, 191, 192, 194, 195, 199. Oranas - 15 (ex 626), 252, 253, 614, 617, 618, 622, 623, 624, 625, 634, 635, 637, 638, 640, 642, 644, 645, 647, 649, 650, 651, 652, 653, 654, 656, 657, 658, 659. NCBC low-floor - 223 CB60 low-floor - 307, 325, 329, 334 CB80 low-floor - 337, 340, 343. Caught a glimpse today of a "new" ex skybus MAN artic in fresh colours, i didn't think that metro would keep the airflow roof on it only one question and that is what is the big lumps on the rear trailer roof for? wisbydriverB40 wrote: Caught a glimpse today of a "new" ex skybus MAN artic in fresh colours, i didn't think that metro would keep the airflow roof on it only one question and that is what is the big lumps on the rear trailer roof for? Tasmanian fans. look out for TassieLink's new bus is due to be arrive by early January. superbossgc wrote: Tasmanian fans. look out for TassieLink's new bus is due to be arrive by early January.